“Market conditions are changing. The continued rise in interest rates suggests we are in the early stages of a bond bear market, which could intensify as central banks withdraw liquidity. The receding tide of liquidity will start to reveal more rocks beyond what has been exposed in emerging markets so far, and the value of a value discipline will be in avoiding the biggest capital-destroying rocks. If a rock emerges on the crowded shore of U.S. momentum, it could result in a major liquidity challenge, as momentum is often most intense on the downside as a crowded trade reverses. So investors are facing a large potential trade-off right now: continue to bet on the current dominance of momentum and the S&P 500, or bet on change and take an active value bet in names with attractive value and optionality, but with negative momentum,” said Clearbridge Investments in its market commentary. We aren’t sure whether long-term interest rates will top 5% and value stocks outperform growth, but we follow hedge fund investor letters to understand where the markets and stocks might be going. This article will lay out and discuss the hedge fund and institutional investor sentiment towards CarMax Inc (NYSE:KMX). Is CarMax Inc (NYSE:KMX) ready to rally soon? The best stock pickers are in a pessimistic mood. The number of long hedge fund positions went down by 3 in recent months. Our calculations also showed that KMX isn’t among the 30 most popular stocks among hedge funds. KMX was in 28 hedge funds’ portfolios at the end of December. There were 31 hedge funds in our database with KMX holdings at the end of the previous quarter. We’re going to take a gander at the latest hedge fund action surrounding CarMax Inc (NYSE:KMX). At Q4’s end, a total of 28 of the hedge funds tracked by Insider Monkey held long positions in this stock, a change of -10% from the previous quarter. 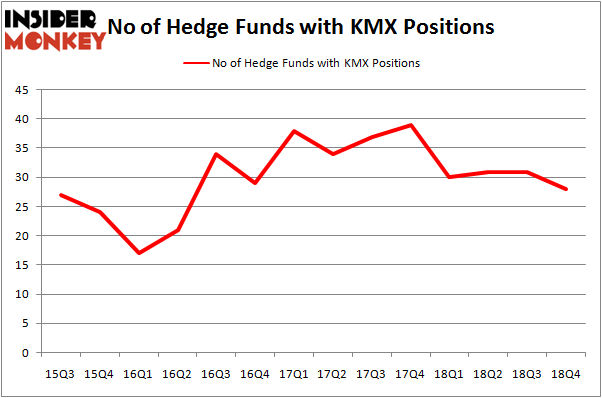 On the other hand, there were a total of 30 hedge funds with a bullish position in KMX a year ago. So, let’s see which hedge funds were among the top holders of the stock and which hedge funds were making big moves. 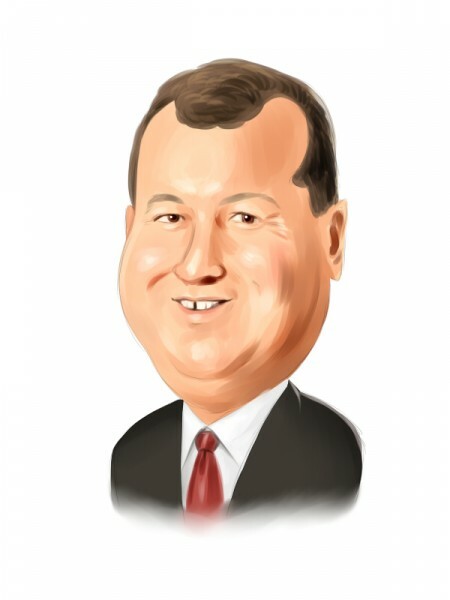 When looking at the institutional investors followed by Insider Monkey, Akre Capital Management, managed by Charles Akre, holds the biggest position in CarMax Inc (NYSE:KMX). Akre Capital Management has a $362.4 million position in the stock, comprising 4.6% of its 13F portfolio. Coming in second is Tom Gayner of Markel Gayner Asset Management, with a $308.2 million position; the fund has 5.9% of its 13F portfolio invested in the stock. Remaining members of the smart money with similar optimism comprise Lou Simpson’s SQ Advisors, Francois Rochon’s Giverny Capital and D. E. Shaw’s D E Shaw. Judging by the fact that CarMax Inc (NYSE:KMX) has experienced falling interest from the entirety of the hedge funds we track, logic holds that there exists a select few hedge funds who were dropping their entire stakes by the end of the third quarter. Interestingly, Bain Capital’s Brookside Capital sold off the largest stake of the “upper crust” of funds watched by Insider Monkey, valued at about $22.1 million in stock. Louis Bacon’s fund, Moore Global Investments, also cut its stock, about $18.7 million worth. These bearish behaviors are important to note, as total hedge fund interest was cut by 3 funds by the end of the third quarter. Let’s go over hedge fund activity in other stocks similar to CarMax Inc (NYSE:KMX). These stocks are Lamb Weston Holdings, Inc. (NYSE:LW), iQIYI, Inc. (NASDAQ:IQ), Wynn Resorts, Limited (NASDAQ:WYNN), and Vedanta Ltd (NYSE:VEDL). This group of stocks’ market valuations resemble KMX’s market valuation. As you can see these stocks had an average of 27.5 hedge funds with bullish positions and the average amount invested in these stocks was $899 million. That figure was $1431 million in KMX’s case. Wynn Resorts, Limited (NASDAQ:WYNN) is the most popular stock in this table. On the other hand Vedanta Ltd (NYSE:VEDL) is the least popular one with only 7 bullish hedge fund positions. CarMax Inc (NYSE:KMX) is not the most popular stock in this group but hedge fund interest is still above average. This is a slightly positive signal but we’d rather spend our time researching stocks that hedge funds are piling on. Our calculations showed that top 15 most popular stocks among hedge funds returned 19.7% through March 15th and outperformed the S&P 500 ETF (SPY) by 6.6 percentage points. Unfortunately KMX wasn’t in this group. Hedge funds that bet on KMX were disappointed as the stock lost 2.6% and underperformed the market. If you are interested in investing in large cap stocks, you should check out the top 15 hedge fund stocks as 13 of these outperformed the market. Is Vulcan Materials Company (VMC) A Bargain According To Hedge Funds? Here’s What Hedge Funds Think About Principal Financial Group Inc (PFG... Is CNH Industrial NV (CNHI) A Good Stock To Buy? Activist Keith Meister Says This Year’s Market Rally and Last December’... Here is What Hedge Funds Think About Flocking Into ZTO Express (ZTO) Is Liberty Broadband Corp (LBRDA) A Good Stock To Buy?